Sometimes on a wedding day an opportunity presents itself and I end up with an image that is very unique. This is what happened on Saturday and I’m thrilled with the result. Charlie is the couple’s little dog and was very much a part of the day, even walking back down the aisle with them after the ceremony. I was with my bride in the morning in their (simply stunning) Edwardian home. The bedroom had a chaise longue just under the large windows with a vintage screen to the left. This is where my bride decided to hang her dress, so of course, I got a lovely dress hanging shot, some lovely shoe shots, the usual arty stuff. Charlie was milling around, such a gorgeous, great-natured pooch … then of course he had to get his ribbon on. I documented this, got a lovely shot of Sal with Charlie, check. Then Charlie did something absolutely perfect … he jumped up to look for daddy out of the window … and bam ! I had something a little different. There’s lots going on in this image, and I love it. I hope you do too. I love it Gill – fantastic! 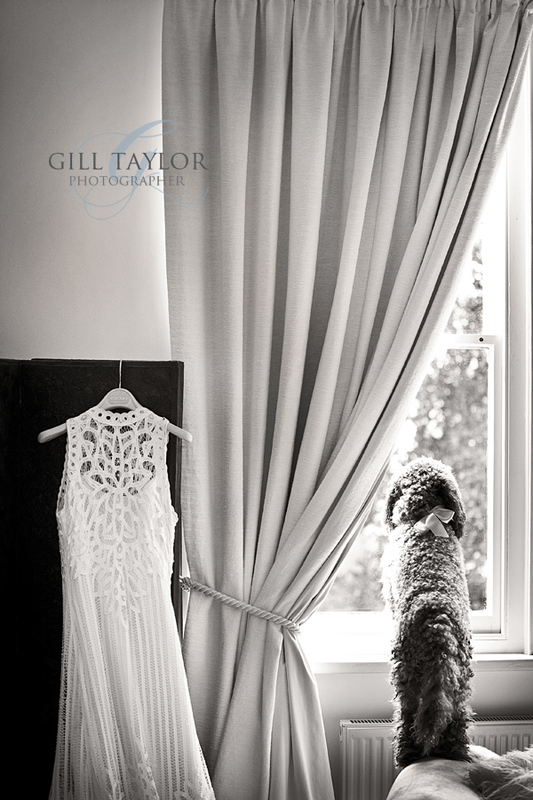 A lovely shot of the wedding ‘dog’- one of a kind! Good timing, Gill! You may remember Connie and Raymond from their engagement shoot in London where they both live and work … however, family life is further north in the bustling city of Liverpool, so that’s where we headed for their wedding. I stayed the night before in the Malmaison Hotel where Connie was getting ready and where the evening reception would be taking place. It’s a lovely little boutique hotel overlooking the river, with views of the Liver Building. Raymond is an architect and so we did a tour of the city before the ceremony, taking in some great locations which perfectly suited his passion, so much stunning architecture around this wonderful city ! 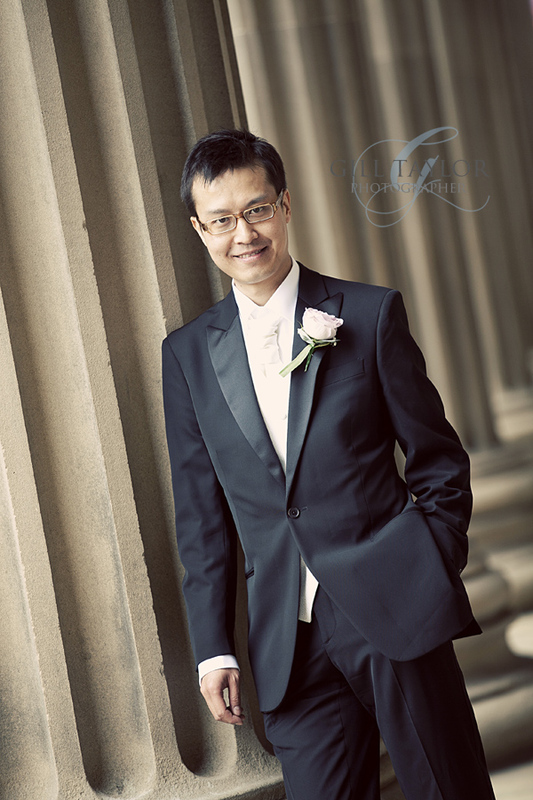 Connie had 3 dresses for the day, starting with a beautiful white wedding dress, before changing into a traditional chinese red dress for the tea ceremony, then finally into another wedding dress for the evening celebrations. Plenty of variety for the photographer, rather selfishly LOL. Random fact of the day … Raymond’s family home backs onto Stawberry Fields … THE Strawberry Fields … their chauffeur took me around the corner while Connie was freshening up so that I could see it for myself, very cool. We drove a short few yards up the road also to take a look at John Lennon‘s house … I have a thing for all things Beatles, so this was a little treat ! And so, a small selection from the day … enjoy ! If you would like to see more, please take a look at my web galleries (please note music will play on launch), or arrange a visit ! Gorgeous images, Gill! Looks like it was a stunning wedding! I really love the last photograph, how the red of her dress pops against the background! Fab photos, Gill! I especially love the shot of the bride sitting on the steps- how on Earth did you get her to sit down outside with that incredible dress on? Lovely! Beautiful photos. 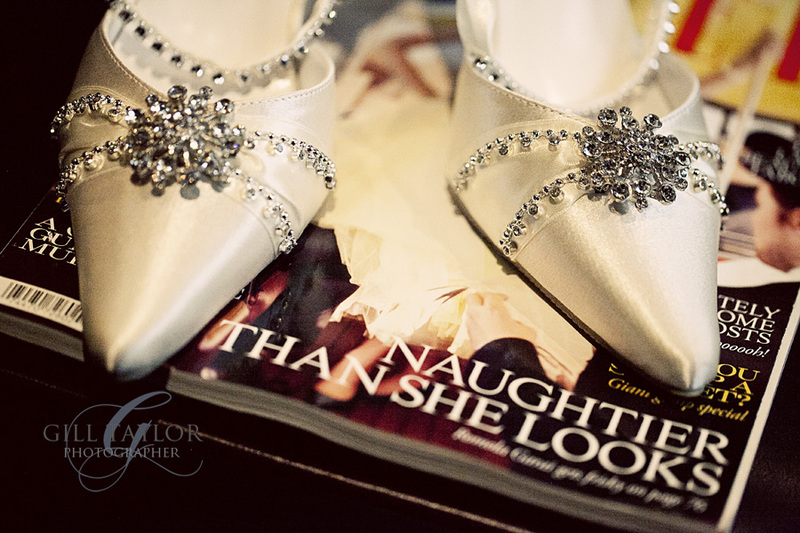 Love the shoes on the magazine. A great set of photos. Love your style. Lovely images and a great sounding day. Bit jealous you got a tour of Beatles related places, I would have lapped that up too. Love the image of Connie on the steps, natural and beautiful. 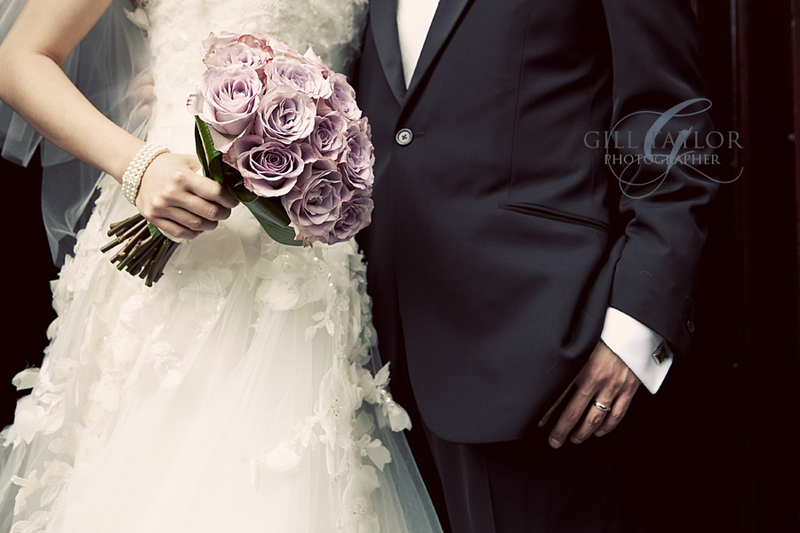 Very elegant couple, elegant photography too! Love these Gill – beautiful, timeless images.